In our dental centres in Poland we aim to deliver excellent value for money. Our services cost up to 70% less than in British practices. It means that you can save £1000 on each tooth implant, £400 on porcelain veneers, and £450 on crowns done in our clinics in Krakow. Prices for other popular dental treatments are also around two to three times lower with Polish My Smile. Such a low cost for our services allows our foreign patients to save around £6,000- £7,000 on average. To receive an individual quote for your dental work in our clinic in Krakow, please describe your requirements or dental expectations on our Get a Free Quote page. We usually respond within 2 working hours. the dental holiday package with Polish My Smile. Prices based on exchange rate 1GBP = 5.2 PLN. 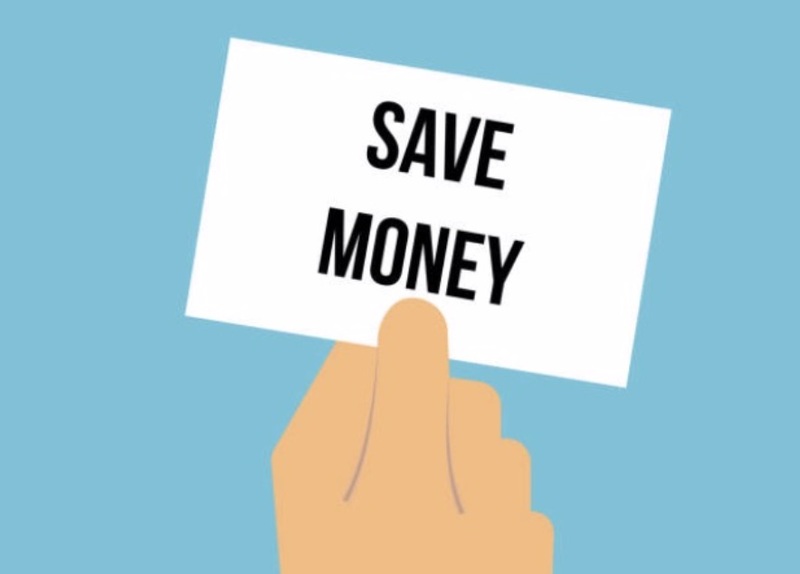 How much our dental patients saved with us? Watch these two video interviews with our patients, who finished all dental work in our clinic in Poland. They say about their experience and money savings they managed to make by having all dentistry work abroad. How much our dental patients saved in Poland? Below there are just a few written reviews from our other patients. You can read more feedback and watch other videos on dentist review section. "It cost me less than a half"
I needed extensive dental work doing that would have cost upwards of 6000 pounds in the UK. My first dental trip to Krakow was for a consultation. I arrived at the clinic and was greeted warmly by the kind staff, and I also noticed (much to my surprise) that the facilites, clinic itself and equipment were much more modern looking than anything I'd seen in England. I informed the Dr of the treatment I wanted, and he immediately told me it was possible, and provided me with a quote minutes later; contrary to the UK where I was constantly told of the complexity of the procedures I needed, referred to multiple different dentists, and quoted ridiculous costs. My treatment required 3 more visits over the next few months, and I couldn't have been happier with the level of service and more importantly the outcome of the treatment I received. It cost me less than half of what I would have otherwise paid in the UK, and received what I believe would have been better results. Also, the PA side of things was immaculate - I changed appointments several times and each request was met with warm efficiency. The whole process could not have gone smoother, and I would strongly advise anyone who can't afford the ridiculous cost of dentistry in the UK, to conisder using this company. Overall, we found the dentists at the surgery and all connected with your Company to be fully up to date with all modern technology (far more so than English Dentistry in our opinion) and the standard was definitely much better, even though the cost was considerably lower. Back home, my wife was quoted £2,500.00 to have two new crowns fitted (these would probably have been the crowns with the metal inserts). In Poland she had 6 fully porcelain crowns fitted, route canal treatment and cleaning, all for £2750.00. I had 8 fillings and full cleaning done for £340.00 and the last time I had one filling at a Dentist in England, it cost me £90.00. "Great service for affordable price"
All my work was £3,100.00. 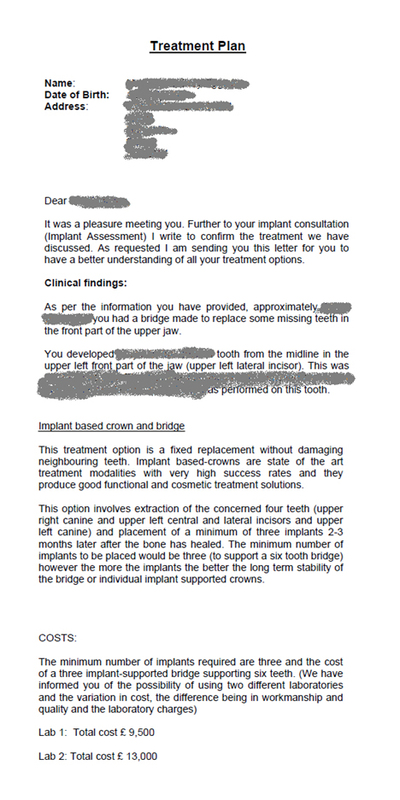 My husband had an extraction, 3 dental crowns and a porcelain bridge and that was £780.00. I had 14 porcelain crowns and 2 bridges and my teeth look fantastic.The price was great but the dentists are wonderful, caring and dedicated. The whole of the staff were friendly and kind. We couldn't fault the dental practice. Thomas had 2 teeth missing and two options were available to him: either to restore his smile using implants or with porcelain crowns fused together in a bridge. He chose the second option, and also decided to carry out some other dental work he needed at the same time. Our dentists fitted him with 6 PROCERA crowns (by many regarded as the world’s best) in the top and another 4 in the bottom jaw at a total cost of £4000. The same amount of dental work based on identical materials would have cost him at least £12000 in England. Before Andrew came to Poland to have his treatment done, he was wearing a denture which was both unstable and uncomfortable. 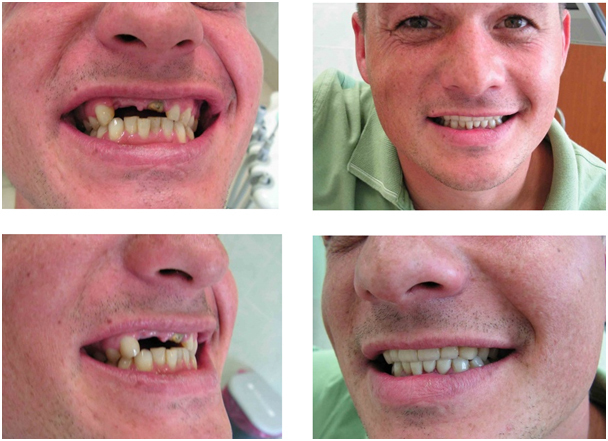 Andrew had many missing teeth and the best solution for him was to have a restoration on implants (implantology guaranteed the stability and strength for his teeth). Our dentists inserted 4 implants in his jaw and rebuilt his teeth on an 8 unit bridge. We used fully porcelain crowns for the best aesthetic results. Andrew visited Poland 3 times to have his new set of teeth fitted, and the total cost was £5,100. Similar solutions in the UK start from £12,000 (based on the same, high quality materials that we have used). 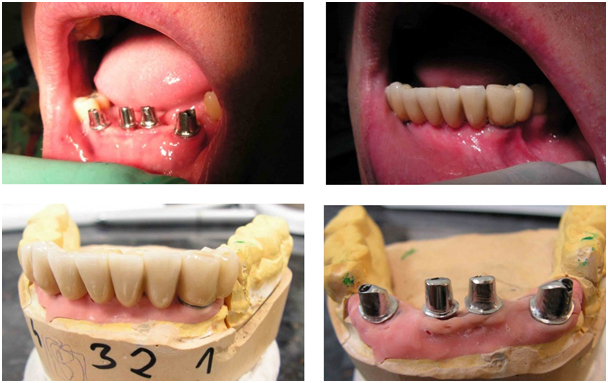 Pictures depict the whole process of Andrew’s treatment, from insertion of implants, to placing the abutments, bridging and permanently attaching the 8 unit bridge to the implants. Below are examples of real cost savings that our patients have made by having a dental treatments done in our clinics in Krakow. 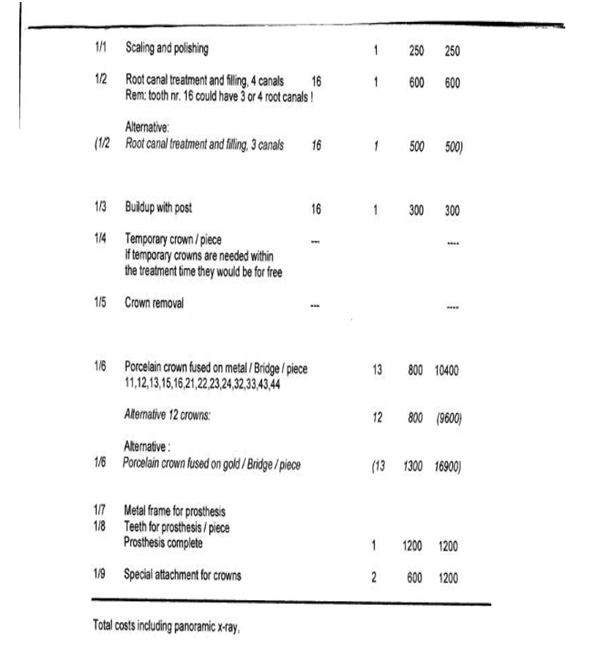 In order to prove the amount they have actually saved, we also included the copy of original treatment plans those patients had received from their local dentists in the UK prior to having the treatment with us. For privacy reasons, we have hidden the name of the patients and the clinic details. Under each UK treatment plan, we included the costs patients have paid in our clinics for exactly the same dental procedures. 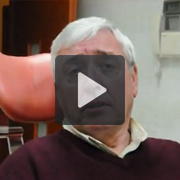 This patient spoke to a cosmetic dentist based in the UK about standard porcelain crowns. 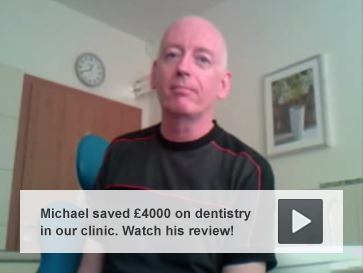 The UK dentist charged £800 for the same treatment which costs just £190 in our Krakow clinic. Even fully-ceramic Procera crowns, regarded as some of the best crowns available by dentists, would have cost less than half what the standard crown would have cost in the UK. The work was completed for the patient during two short trips. She was so pleased with the results of her treatment, as well as the massive savings, that she allowed us to use a copy of her original UK treatment plan on our website. The quotation shown below was generated for the placement of three dental implants as well as a six-unit bridge on the top set of teeth. The quote was provided by a UK clinic, totaling between £9,500 and £13,000 depending on the laboratory which was chosen. This quote is for standard porcelain crowns only, and no CT scan was given prior to the quote being provided. The patient approached our clinic for a quote for the very same work. The same placement of three implants and an identical six-unit bridge came to £3,800 in total, representing savings of more than £5,000 on these standard crowns. We also compared our price for the highest-quality, full-porcelain crowns and discovered the cost in our clinic would be less than £5,000, allowing the patient to save over £8,000 on the cost of the work in the UK. The treatment plan showed no indication that a bone graft was required, meaning the work could be completed over three short trips. The travel and accommodation expenses were predicted to be just £500 in total.